I stopped in at my local store today but there was nothing new that wasn’t out in stores last week and they didn’t get the typical product drop today that happens Mondays. They opened boxes on Thursday or Friday with the new tanks (Full Eagle, Power Dance Tanks, Bliss Tanks, Waltz Pants, Totally Tote Tastic Bag). I tried the Pink Mist Mind Over Matter Pullover and it was so lovely but it just made me sad because I know I won’t wear it casually or for running until the fall so it didn’t make sense to buy it now, much as I loved it. I guess since I haven’t spent my Lulu bucks this week I’m free to spend them Friday at the Grand Opening Of the Vancouver Anthropologie. I’m slightly bummed that the Surge Modern came out after the Cool Racerback since I wont buy both in the same color but I already have a snorkel Modern Racer (not Vitasea). Although I love the Vitasea Modern Racers so much that I may have offloaded Snorkel to replace it with this one. I was told by an educator today that well see more tanks in this style in the current color palette. I know, not much to go on with that but I guess she means strappy and with this type of v neck. I like this one in Tango Red! 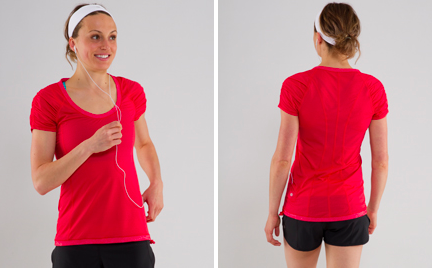 Enjoy a mid-summer run in this lightweight, body-skimming, short sleeve running top! "Scuba Hoodies Toothpaste & Surge"